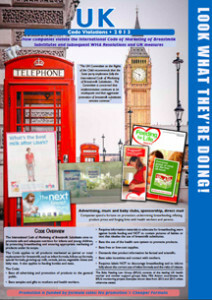 Baby Milk Action has been contacted repeatedly about two events being sponsored by Danone in the UK in coming days: Tommy’s baby race on 30 June, promoting the Cow & Gate formula brand, and a Royal College of Midwives training event on 11 July. These events follow Nestlé’s entry into the UK market, which has seen more aggressive marketing practices, driving down standards for the industry as a whole. At present Nestlé is targeting health workers around the country, trying to entice them to events at hotels. Baby Milk Action is organising protests outside these events – click here to find an event near you. Danone is second to Nestlé in the global market and the companies are locked in fierce competition. The marketing war has now reached the UK. Danone is becoming increasingly aggressive. It is even sponsoring a forthcoming conference by the Royal College of Midwives on 11 July (download pdf). Baby food companies obviously have a conflict of interest in funding such events. The International Baby Food Action Network (IBFAN, of which Baby Milk Action is the UK member) sets this out clearly in its briefing paper on sponsorship. IBFAN notes that the World Health Assembly has addressed the issue of sponsorship in Resolution 49.15 from 1996 and again in Resolution 58.32 from 2005 where it stated care was needed: “to ensure that financial support and other incentives for programmes and health professionals working in infant and young child health do not create conflict of interest”. When people claim that such events would not go ahead without company sponsorship, we always remember the case of India, where the Indian Paediatric Association (IPA) decided not to take baby food company money. They said they would rather have events at cheaper venues and pay for their own lunch. This ban on sponsorship was later introduced into Indian law, partly because of action by the IPA. If India can do this, then lets start a debate in the UK and other countries about doing the same. It is difficult sometimes for health workers to avoid these events – but a suitable t-shirt will help them to stand up and be counted. Would you like a t-shirt with the message like that shown left? Let us know your views – and alternative ideas – click here. In another sign of the increased competition, Danone is rebranding its initiatives targeting health workers with formula brand names and is also using good causes – such as the Tommy’s Baby Race at Bluewater on 30 June – to promote its Cow & Gate brand. Baby Milk Action has filed complaints with the Advertising Standards Authority (ASA) and Trading Standards about the promotion of Danone’s Cow & Gate brand on the Tommy’s website and misleading claims made about the company’s so-called growing-up milk, an unnecessary product that simply rips off mothers by making them think they need special milks for babies when they stop breastfeeding or using formula. We are not calling for people to boycott Tommy’s event, but supporters of the charity may wish to question how it is that Tommy’s has been drawn in to increasing Danone’s formula sales and customer loyalty. Parents have a right to accurate, independent information on infant feeding. Danone and Nestlé are violating national and international marketing standards. Their events for health workers are also an attempt to circumvent the restrictions many health facilities have in place to stop company representatives targeting staff. In these health facilities, companies can only provide information on their products to a designated expert staff member (or a multidisciplinary committee in some regions), who will assess the accuracy and only pass on what is necessary. Company information is often misleading: Baby Milk Action has already won cases about bogus claims made for Danone and SMA formula in advertising. For example, both Aptamil and SMA have been claimed to be the “best” formula – but these claims were found to be misleading by the ASA as the companies could not subtantiate them. We receive increasing reports of parents requesting formula from food banks because they cannot afford it and last week new figures showed breastfeeding rates have fallen in England – click here. For all these reasons, Baby Milk Action is running a “No promotion, Cheaper formula” campaign – sign the petition here. For further examples of how companies are breaking the rules see our new monitoring report, Look What They’re Doing in the UK.